If you’ve ever come across a well-grown wisteria vine, you might remember how breathtaking it was! The lavender blue flowers cascade from the branches in a spectacular display of beauty combined with a lovely sweet fragrance. 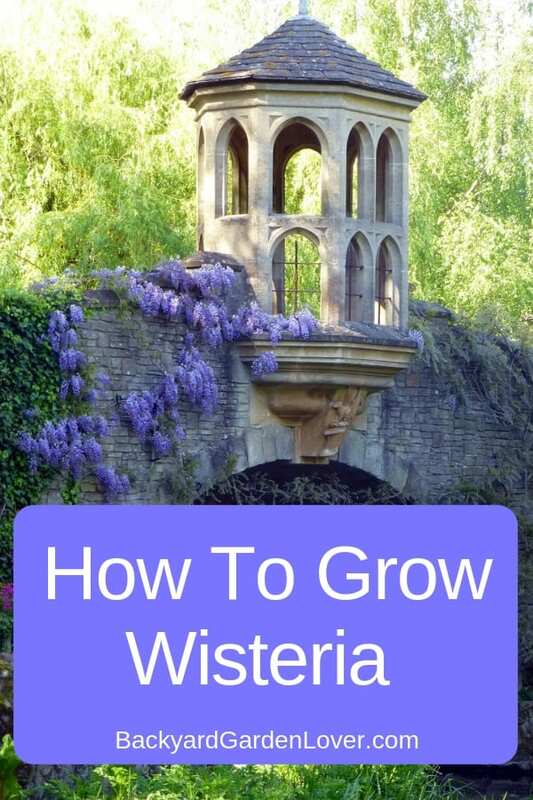 Learn how to grow Wisteria in your own garden. Wisteria thrives in sunny south or west-facing exposure where it climbs by using its twining shoots. Every spring it produces cascades of lovely lavender flowers. 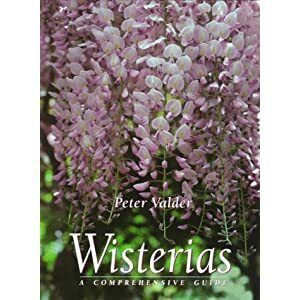 Wisterias: A Comprehensive Guide One of the loveliest of all the hardy climbing plants, Wisteria is also the earliest to Bloom. From the south to the north, cascades of blue flowers appear in early spring to tell us warm weather is on its way. Although Wisteria sinensis is native to the warmest provinces of China, it is quite hardy and will grow in much cooler climates. It is hardy to -10 to – 20 degrees Fahrenheit. It is most successfully planted in a warm, sheltered spot facing south or west. Wisteria can grow to en enormous size. Left unchecked, it can grow to a height 15 feet or more. The older it gets, the better it blooms. Wisteria is invasive if not pruned properly and often. Remember to plant it AWAY from paths and house foundation. Remove fresh shoots throughout the summer, to keep them under control. Or, plant it in a large pot to contain it easier. 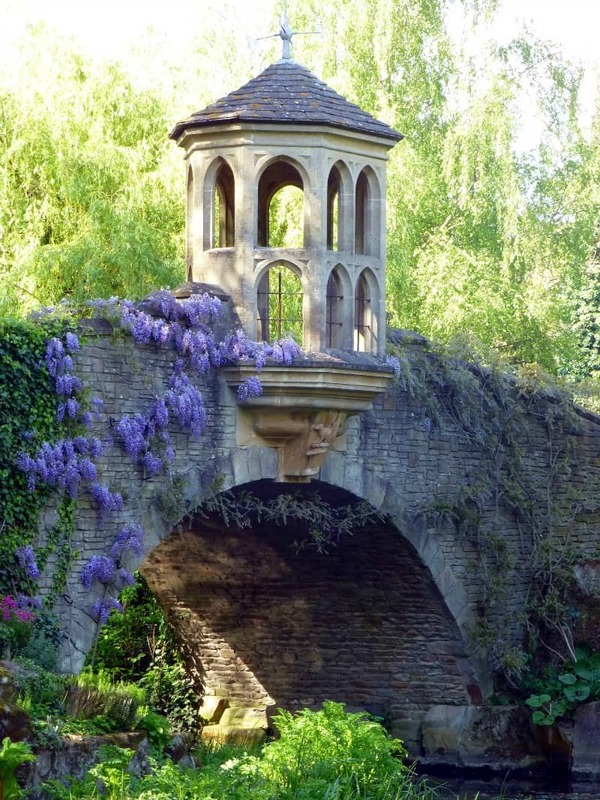 Wisteria climbs using its strong, twining shoots, but it cannot grip a wall by itself and needs support in the form of a strong trellis, pergola or arbor. The compound, pinnate leaves can have 9 – 19 leaflets, depending on the species. Wisteria is deciduous and the leaves appear either at the same same time or just after the flowers. There is often a second flowering in late summer, but it is never as profuse as the first. It may take years for a Wisteria vine to bloom, but being patient is worth the wait. 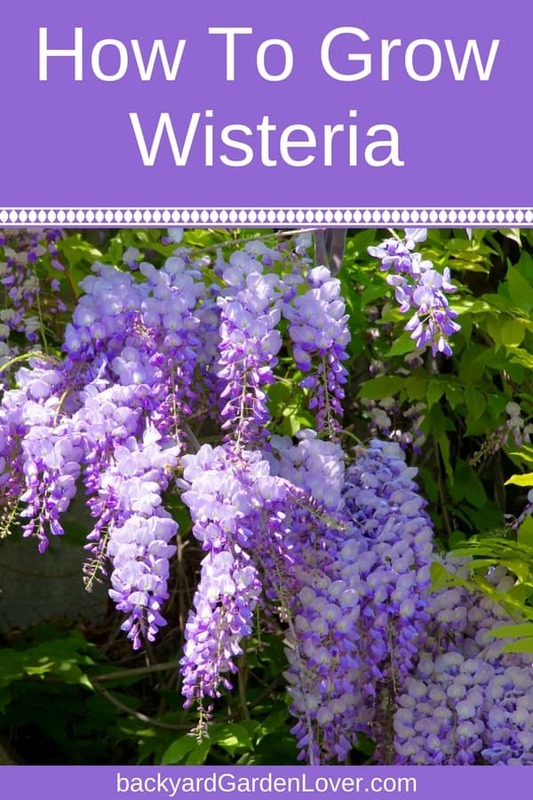 Most wisterias need to reach a certain age (3 to 5 years or more) before they will bloom. 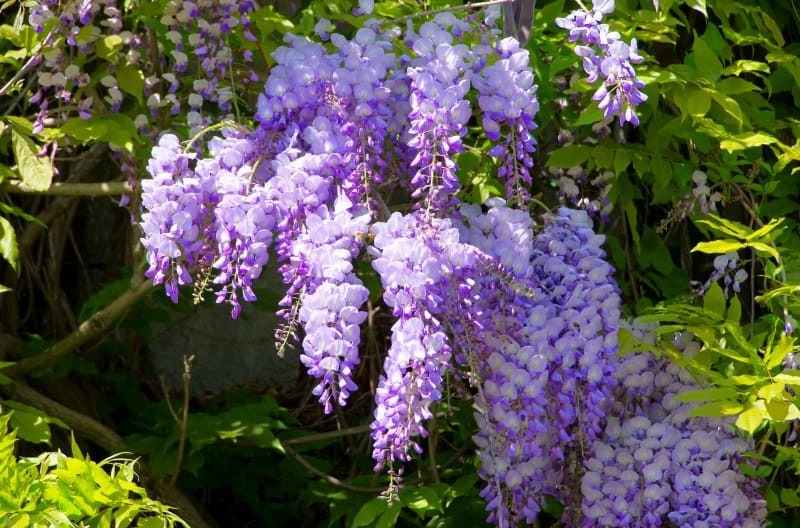 Flowering can be encouraged by planting Wisteria in a rich fertile soil, although it can grow in sandy soils too. Chinese wisteria has a Japanese relative, Wisteria floribunda. It requires similar conditions, but the flower color is more lavender-purple, and the flower clusters are longer. 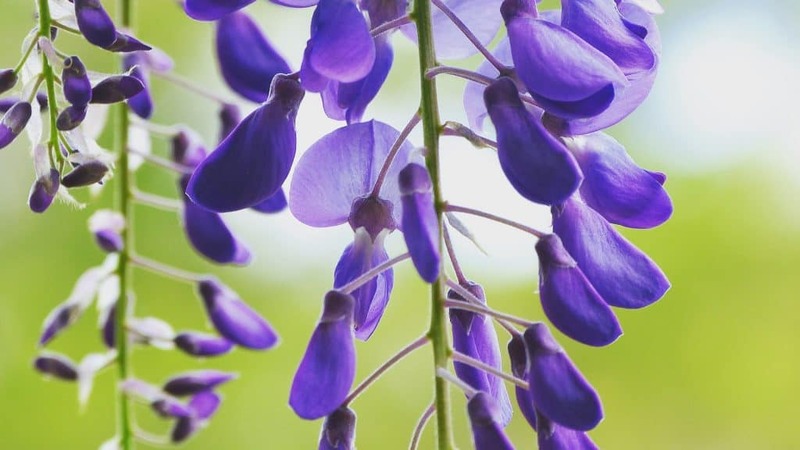 Japanese Wisteria opens its flowers gradually from the top of the clusters to the bottom, whereas Chinese wisteria open this flowers nearly all at once. 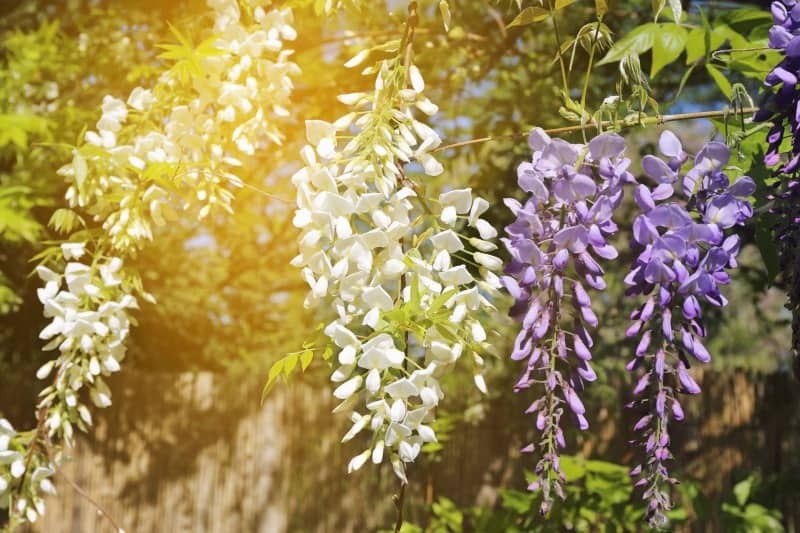 Japanese Wisteria also comes in white and pink flowered forms, plus the spectacular “Longissima” and “Longissima Alba” varieties which have incredibly long flower clusters. Given ideal conditions, these clusters can be up to 5 feet long. Buy and plant wisteria in the spring. When buying a Wisteria, remember that it can become quite large and needs plenty of room. This goes to the roots too. They are very long and like to grow deep into the ground. If you plan to grow wisteria in a pot, make sure you use a container as large as possible. Good, rich garden soil is best. If the soil is hard and clayey, mix in some compost. August is the month for cutting back the Wisteria. Use this time to remove unwanted or overly long stems: otherwise it will develop rampant, tangled growth and few flowers the following year. Cut the side shoots back to about 10 inches. This will encourage the growth of flowers from the same side shoots the following year. Feed with a balanced fertilizer two or three times during the season. Move the plant only if it’s really necessary, since this will usually set it back a bit. This should only be done toward the end of the winter dormant period. Young plants may take a few years to settle down and start growing. There is nothing wrong if there aren’t any flowers for the first couple years. If planted against the warm sunny wall, wisteria must be watered well. Never let it dry out. Plants which grow on hot walls get reflected heat and lose more moisture through evaporation than other plans in the garden, especially in dry weather. Less water is needed in winter, but once the flower beds begin to form, regular watering is again needed. Feed with a good balanced fertilizer to to 3 times a year. It is very easy to get Wisteria seeds to grow: just soak them overnight and plant them in a seed tray. However, one can never be sure that the resulting plants will flower well. Wisteria grown from seed may never flower, and in most cases, even if it does, it may take years (up to 20) to do so. A better way is to plant hardwood cuttings in late winter before the flower buds swell, or graft on root-stocks which can be grown from seed. In a sheltered spot, wisteria can bloom quite early in the spring but it usually takes 3-5 years from planting before it is of mature “flowering age”. The long hanging cascades of flowers are mostly in various shades of lavender-blue but there are also pink and white varieties. The flowers have a lovely sweet scent. If you like sweet smelling flowering vines, you’ll love growing honeysuckle. The flowers may fall off if the weather is too cold and stormy. Yellow leaves and weak growth is probably the result of poor soil. Feed with a balanced fertilizer. Aphids and other insects may occasionally visit the wisteria, but rarely, if ever become a problem. Fungus diseases are rare on Wisteria, but if you see black patches on the leaves, treat the plant with a fungicide. It’s nice to see the beautiful wisteria flowers gathered together in stunning displays, but I love looking at the individual flowers as well. So pretty! I can only imagine sitting under this wisteria vine with a good book on a late spring afternoon! Dreams…. Wisteria is usually purple, but occasionally you’ll see a pink wisteria. What a delightful show of beauty! This wisteria vine growing in the wild creates a beautiful scene. 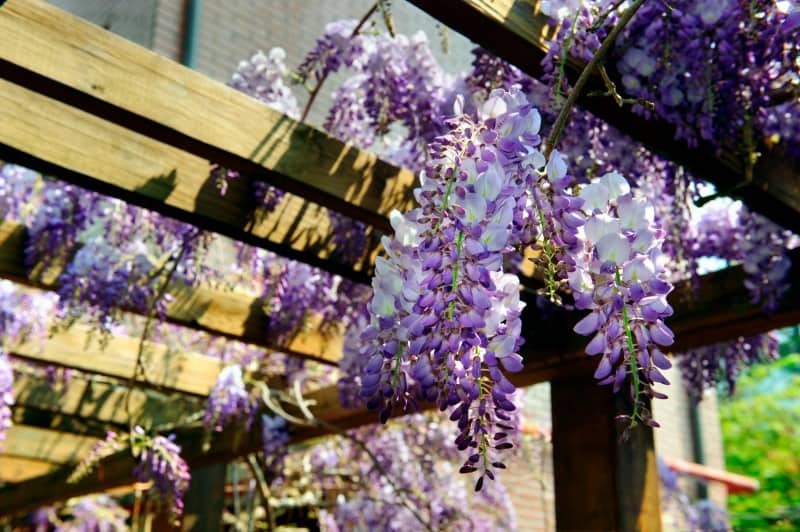 Are you ready to plant a wisteria vine in your garden? Now that you know how to grow wisteria (and let’s be honest: it’s quite easy), are you ready to plant one in your yard? An excellent climber to grow on a wooden pergola or arbor, the wisteria vine can add real beauty to your front yard. It can also create the most enchanting quiet spot in your backyard, where you can escape to read a book or just listen to the birds and enjoy a quiet afternoon. 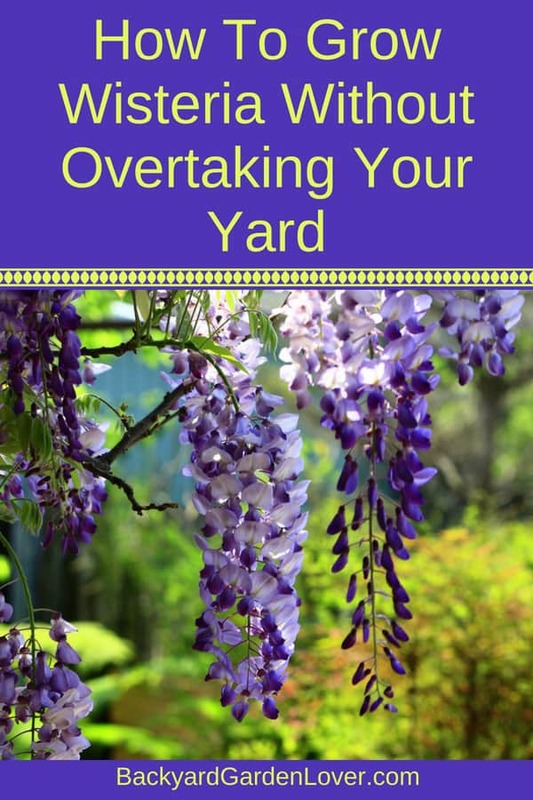 Remember that wisteria can overgrow if not pruned on time. Its roots can also grow quite big, so remember to plant it where it won’t disturb your house foundation or a nice path to your front door. One last suggestion: since it’s a rather overwhelming plant, give it room and keep it as a solitary plant rather than mix it with other plants. My mother planted a wisteria start in my yard from her vine 40 years ago. I HATE it!!! In that 40 years I had 1 bloom. I’m talking about “1” bloom. I hate the determination of the vine. I have trimmed it until I was blue-in-the-face & the first thing I knew it was entwined in a tree. I love the beautiful blooms & the gorgeous fragrance but hate the vine. Maybe a wisteria tree. That’s an old wisteria. there’s a lot that could have happened wrong with it for the last 40 years. If you can, just remove it form your yard and start over with a new one. Can an old vine be dug up and moved in early spring? Will it continue to flower after transplanting? Wisteria doesn’t like to be moved, but if you must, make sure to get as big of a root ball as you can, and do it in the morning or evening, while it’s a bit cooler. My husband and I moved into his grandmother’s home back in 1991, she had one of these gorgeous plants. She kept it well trimmed in her years with it…fast forward 26+ years. I LOVE the marvelous, huge, fragrant flowers, it is the long roots on top of ground that are my concern. Can I simply cut them off with my shovel? Will this hurt the plant/bush?? Here in NC, the plant has become invasive in wooded areas, along roadside. It grows high as the tallest pine and usually suffocates the tree! So, YES, trimming is a must!! Yes, it will probbaly hurt the vine, depending on how much you’ll cut. Not sure if it bothers you because it looks bad, or other reasons. If it’s just an esthetic concern, maybe you can build a box/bench around it. My Westeros quit blooming.Its 18 years old how can I get it to bloom again?? Did you happen to prune it too aggressively? That might be the reason. If so, wait for the next season and see if it blooms again. If not, next year dig a shovel a coupe feet from the plant to cut some of the roots and shock it. It might get it to bloom again. My wisteria its quite old (possibly 25-30 years old). When I planted it it took years to grow but after the pine tree died and had to be removed it bloomed for 3-4 years heavily then nothing. I trim it and prune it and fertilize it. The trees that shelter it are getting quite large now, could that be the problem? They are close to 25 ft away but South West of it. I don’t want to lose my plant but it’s not a pretty plant any more. Did you by change over-prune it? This is the 2nd year after planting my wisteria and it hasn’t grown any twining shoots yet, is this normal and when will it start. it has flowered twice now, but hasn’t grown in size at all. My wisteria destroyed my vinyl trellis – working too much and too little time to notice how it was growing so fast and it twisted the vinnyl till it snapped it – they are very strong plants ! We bought a wisteria tree. It is planted about 8 feet from the back of our house. I trim it in the fall,and it is about 5 feet tall. After reading this I am worried about the roots and our foundation. What does actually happen? Christine, you are probably safe if you keep on top of it: prune it every year and don’t let it get out of hand. If you feel better, you might want to use an underground barrier to direct the roots away from your house. 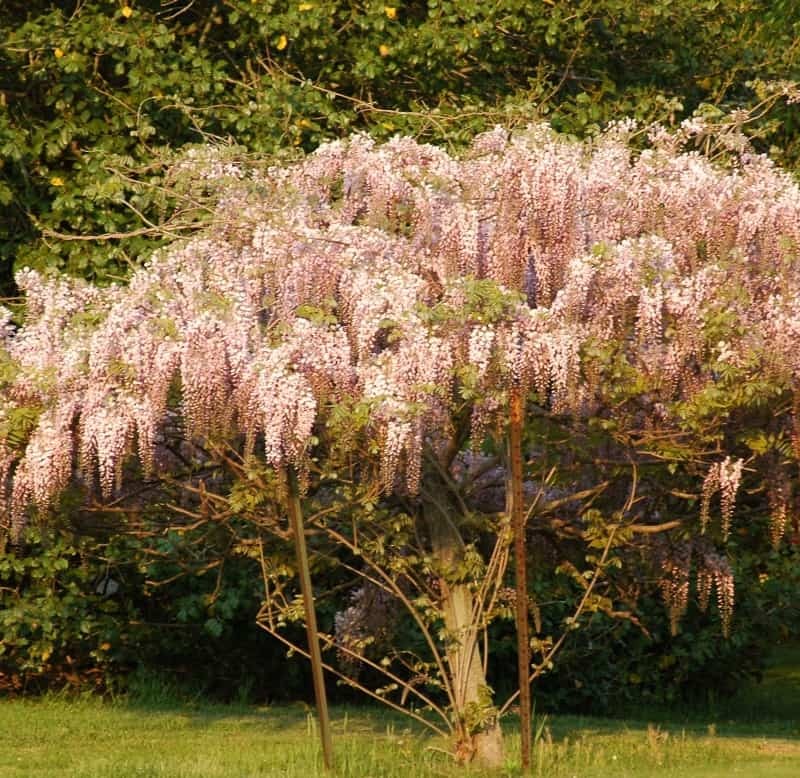 I’m wondering if I can train a “summer cascade” wisteria macrostachya “betty Matthews” to be a stand alone tree. I have seen the Asian varieties grow like a tree. If not could I grow it into a mature oak tree? 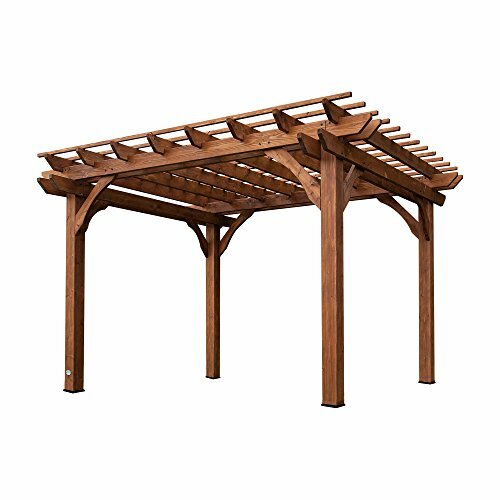 I just don’t want to use a pergola and my ideal spot is in the middle of a field. Michael, I wish I could help, but I don’t now enough about it to speak intelligently. If you have any nurseries close by, might be worth a chat with them. If not, there are a few online nursery that could help. Yes! You can! Just remember to Think Bonsai! Lol! In Summer, prune the wild new growth. In Fall, prune side branches as directed within article, back to about 10″. Also, lift in late Winter, every year or two, to shock-prune root ball, to keep it all in check and enjoy a more prolific bloom. Enjoy! I planted a wisteria about 7 years ago. 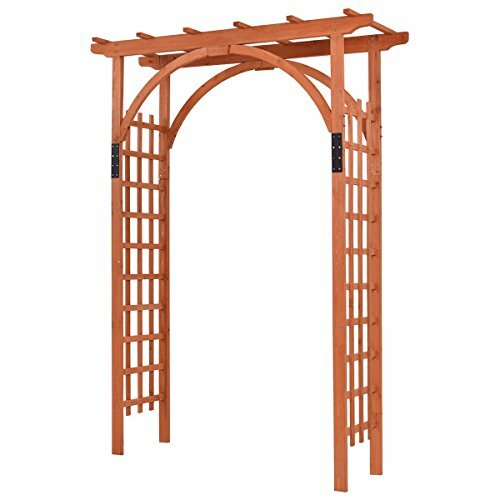 I even had a trellis built for it above the gate, so that it could display it beautiful flowers. It never flowered until last year, with one flower, this year it had two! I am so disappointed! Ive seen that happen with a wisteria down the street the first time i ever saw it bloom it only had a single bloom, this year it it was covered. so every year it blooms it will have more blooms just give it time it should do better every year. Maybe if you add a little bone meal that should give you more blooms. Good luck! I bought a very small wisteria from a garden centre. It was perhaps 18″ tall. I planted it in my backyard with a metal support. First summer nothing. Second summer maybe 5 blossoms and it had grown to about 3 feet tall. By the third summer, it was over 6 feet tall and cascading over itself. I have100’s of beautiful blossoms over the entire vine. I love it. Every year I trim back the longest of the vines and it just keeps getting better and better. I have a Wisteria vine. It was planted in a corner and very close to other plants. It strangles all of them. I’d like to move it but I’m afraid to kill it as it’s a beautiful plant. I’m guessing it’s been there for at least 15 years or so(previous home owner planted it). If it can be moved, what time of year should I try to move it? Also it is in the ground, would it be ok if put in a large container? Could you move the other plants easier? Wisteria doesn’t do well if oyu transplant it: it might stop booming for several years. If you really want to move it, try late fall to early spring, while it’s dormant. No. Unfortunately it’s planted right in the corner of the yard. So, not only is it strangling my plants near it, but also my neighbors on the other sides of the fence. It’s such a beautiful plant though that I would love to save it and move it if possible. Is wisteria harmful to cattle? If they eat enough, yes, it could be harmful. We bought an old house in Virginia that has 30-year-old wisteria that has destroyed the pergola, ruined the gutters, climbed into the trees, and is just too overwhelming to keep back. Its trunk is at least 8 inches in diameter. I fear that its roots run under the deck and probably under the house. How do I get rid of it for good? One week of lovely blooms isn’t worth the horrors. Ugh.. I’m sorry to hear that. Yes, while beautiful, wisteria is pretty invasive in some parts of the world. Cut it from the ground, remove all cut limbs and treat with roundup or another strong herbicide. Make sure to gather up all the seed pods too. Hope this works for you. How deep do the roots go in terms of depth, and could it be compared to an oak in ruining foundation or sidewalks What climbing flowering vine would you suggest next to a bar-enclosed from porch made of concrete. I could also plant along chain link fence. It is south facing. In Houston. Lots of heat and humidity, mild winters. Occasionally a freeze or two. That must be so exciting! I’d LOVE to see pictures when it blooms again this year. If you remember, please stop by and share a picture. Kim, some wisteria need 15 to 20 years before they start blooming (if they were planted form seed). Another reason for not blooming could be too aggressive pruning, or if it;s planted in the shade. 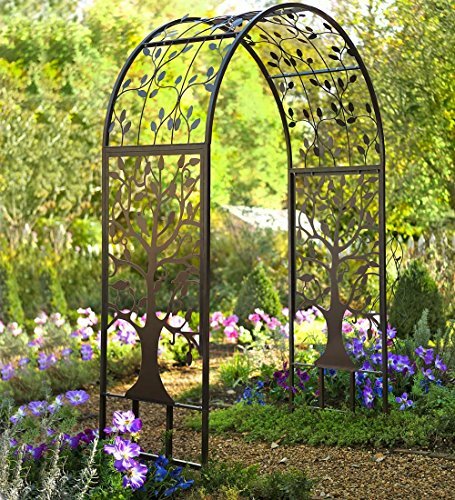 i was thinking of getting a wisteria to put on a split rail fence. Would this work? Karen, it can work, but you’ll need to stay on top of pruning it. If not, it will damage your fence over time. 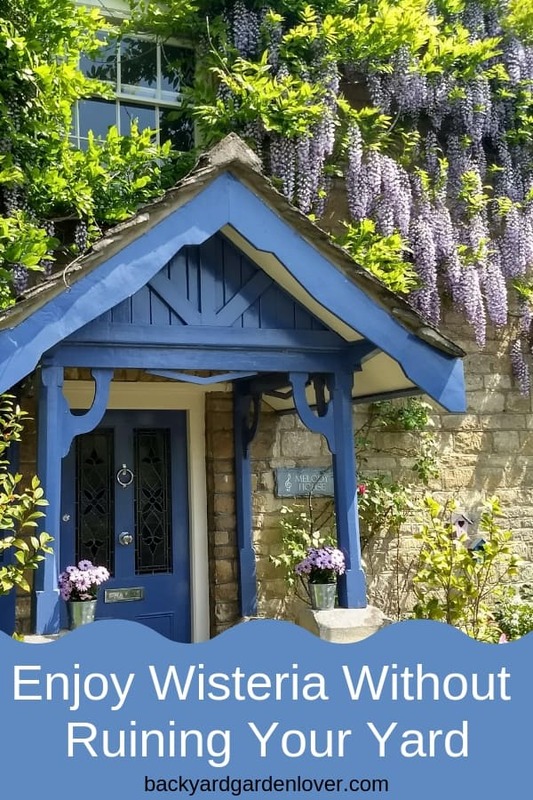 My wife and I purchased a home in northeast Ohio that was built in 1830….there is a large wisteria planted between the summer kitchen and wrap around porch that faces south but has some protection. We found out from folks that had lived there in the past that the wisteria is very very old. In fact we had a woman in her 80’s stop by just to see the wisteria her grandmother had planted. She said the wisteria was well over 100 years old and she remembered it being full of blooms, which it was doing when she stopped by a few years ago….I’ll never forget the tear running down her cheek while giving a slight smile. She seemed satisfied as she enjoyed precious memories of her childhood! We talked a bit and then she left, and we haven’t heard from her since……the wisteria, it continues to give us beautiful blooms every spring no matter how or when we trim it…. Thanks for sharing Glenn. Please share some of your wisteria pictures on our Facebook when it blooms this spring. What kind of wisteria grows faster than the other ? In my last house I had two of them outside one of them a Chinese wisteria and the other a Japanese wisteria. One of them grew excessively well and fast and the other one barely grew it all, and we were there 13 years. Just would like to know which one was the fast growing wisteria. Where I live in SC it is not sold and not recommended as the invasive nature of if damages natural wooded areas.